Combine cabbage, apples, carrots, and Schwartz’s® Bread & Butter Pickles in a large bowl. Mix the mayonnaise, lemon juice, sugar, vinegar, salt, and celery seed in a small bowl. Add to the cabbage mixture; stir to combine. Refrigerate, covered, for at least 1 hour for flavors to blend. Makes 3 quarts To prepare pork: Combine the pork and barbecue sauce in a stockpot. Cook over medium heat until temperature reaches 165°F. 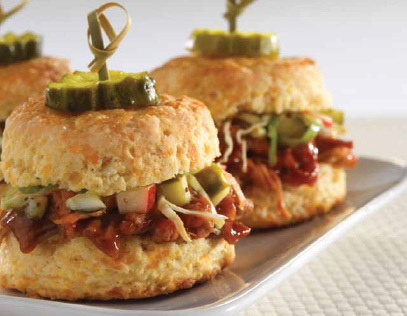 Top each cornmeal biscuit with 2 tablespoons barbecued pork and 2 tablespoons coleslaw. Garnish sliders with additional Schwartz’s® Bread & Butter Pickles.